The K&M 14077 Keyboard Bench is extremely, with sturdy tubular steel. This bench is height-adjustable, features a wobble-free design, is collapsible for easy transport, and features a White imitation leather seat. 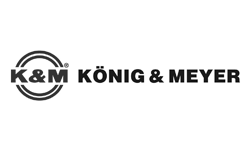 Same Day Music is an authorized dealer of Konig & Meyer products. - Height: from 15.945 to 23.819"
- Seat: imitation leather seat, size 25.591 x 11.811"